The creator of lithium-ion battery has a new invention that will greatly enhance the usage of batteries and probably energy application around the world. 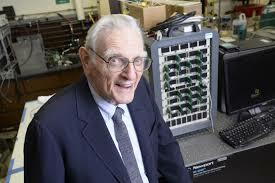 94 - year old John P. Goodenough was immensely praised and credited for his initial creation, the lithium-ion battery. His first innovation powered several known devices and machinery today; laptop, smartphones, digital watches, cameras, and even car batteries. John P. Goodenough has finally gone above everyone's expectations and developed a lithium battery that has the capacity to carry three times that of his initial invention. Not only does this new innovation hold more power but it can charge way faster than its ancestor. The initial charging time for batteries are usually hours and this new invention can be charged for under minutes. “Cost, safety, energy density, rates of charge and discharge and cycle life are critical for battery-driven cars to be more widely adopted," says Goodenough. "We believe our discovery solves many of the problems that are inherent in today’s batteries." These new batteries that are so-called 'Solid state' means that they are no longer supported by liquid electrolytes instead they are made out of solid matter. These Solid state batteries can power a car battery longer than the ones the world has today since liquid easily evaporates than that of solid.